Unhinged LGBTQ protesters defaced Donald Trump’s star on the Hollywood Walk of Fame. Photo credit Gay West Hollywood. 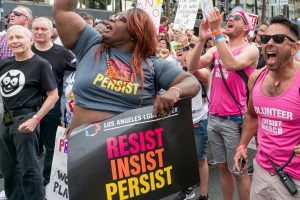 The annual Gay Pride march in Los Angeles was officially renamed the “Resist March,” with a message devoted to attacking President Donald Trump, the Republican Party, and conservatives in general. Thousands of demonstrators gathered in Hollywood on an overcast Sunday morning, waving rainbow flags, pink-white-and-pastel-blue “trans flags,” and anti-Trump signs — many of them profane.